Kawai pianos are some of the very finest pianos available on the market, offering exceptional value for money. Combining state-of-the-art technology with modern craftsmanship, Kawai are very highly regarded in the music industry. Here at Richard Lawson Pianos, we are proud Kawai piano dealers who aim to provide the very best Kawai pianos to our customers. We stock an exceptional range of Kawai piano models, from the smallest 108cm models, to top-of-the-range hand finished 132cm high pianos. Upright pianos that we supply by Kawai include the AT 14 silent piano and the HAT 20 AT, both featuring Kawai’s silent upright system, while the Kawai K50ME gives a fuller, richer tone, benefiting from the Millennium action upgrade. 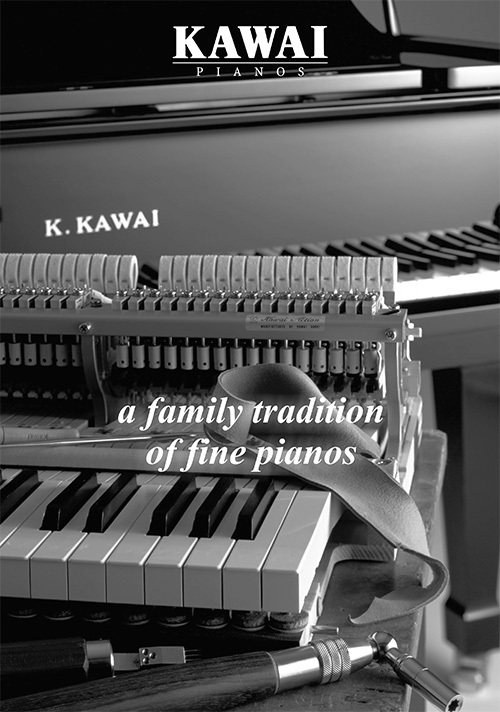 We also have an extensive inventory of Kawai digital pianos. These are equipped with a range of hi-tech features such as USB digital audio and soundboard speaker systems, making them ideal for family entertainment or for discerning pianist looking to refine their craft. Popular models of Kawai digital piano include the Kawai KDP90. While we are perfectly equipped to provide our customers with brand new Kawai pianos, here at Richard Lawson we also have fully refurbished used Kawai pianos for sale. These used Kawai pianos can often be a better choice on a budget, costing a fraction of the price of a brand-new Kawi piano while still offering perfect playability for another 50 to 60 years. Every used Kawi piano we stock undergoes a comprehensive 113-point check, leaving our customers in no doubt that their piano will still sound fantastic. We are so confident in the quality of our used Kawai pianos that we offer the same five-year guarantee as we do on brand new pianos. We also offer sensitive and personalised customer service to keep your piano in tip top shape. If you are interested in purchasing one of our Kawai pianos please browse our site for more information, or give our team a call today for our expert advice.